Comments: Comments Off on Why change fails? Comments Off on Why change fails? We’ve all heard the phrase “the only person you can change is yourself” Yet when it comes to making a business change we need others to change, we need everyone to understand and move to the new way of working. So why does change fail so often? Humans are social beings it therefore makes sense that even at work we need to inspire people on an individual level, remember though the only person you can change is yourself. We need to inspire change in others we cannot force them to change. The success of change can be explained with the Law of diffusion of innovation. 20% of people will be innovators or early adopters, lead the way, they want to be the first to show people what they have is new. 60%, the early and late majority will sit on the fence and wait to see if the change really is a benefit, if Microsoft really have removed all the bugs from the new Windows software before they install it on their computers. 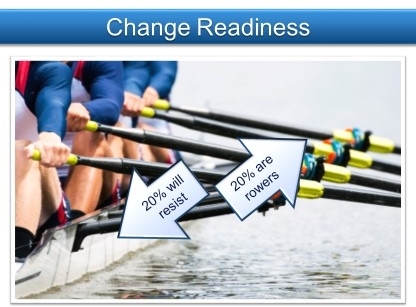 The final 20%, the laggards will resist and only change when they have no alternative but to take part. These are the people who only buy a digital TV because the analogue signal has been switched off. What does this mean for change programmes? The best approach is to run many pilots within an organisation. A pilot approach lets everyone see the change, what is expected of them. The pilot approach appeals to the first 20% the early adopters because they can be first to be involved, it will be novel enough for them to get excited. As we develop the pilot we introduce some very clear methods that are easy to follow, the encouragement then comes as the early adopters show and talk about what they are doing. 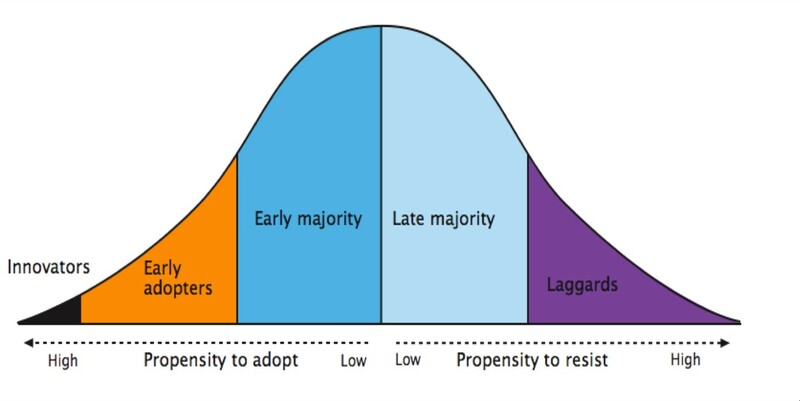 The ideas diffuse from the early adopters to the 60% majority who slowly start to join in. But remember, the pilot must have tasks and change the process in a way that is easy to follow and easy for the early adopters to explain. What then of the final 30%? By now your change will have gained momentum. The change you are implementing will have manifested itself physically and the old way will be switched off, the laggards will have to adopt the change. The hardest part in making change happen is bridging the gap between the early adopters and the majority. 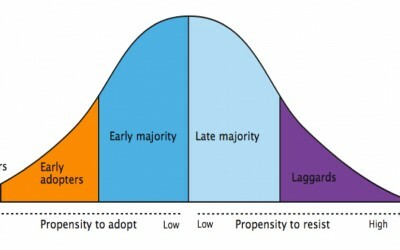 The only way to leap this chasm is to encourage the diffusion of ideas between groups, increase communication by 10, let the early adopters do the talking. Did you make an IMPACT with your last change?